Last night fans at Stockton’s 99 Speedway were treated to the spine tingling spectacle of watching 29 high powered USAC/BCRA Midgets, in the traditional three abreast formation of the Indy 500, thunder to the line to take the green flag for the start of the "Gerhardt 100" feature. Defending race champion Michael Lewis, (left), #40, of Noblesville, Indiana held the lead through the first 40 laps of the Midget race, but his teammate Billy Wease also of Noblesville, Indiana was able to get just close enough to attempt an inside pass going down the front straight when Lewis was slowed by a back marker. The two rubbed wheels, which sent Lewis into a spin and Wease into the lead. After that incident Wease, age 19, never looked back as he cruised to the biggest win of his young career. "Michael (Lewis) went high and I went low and he came down as he tried to pass a slower car and we touched. It was just hard racing. There was nothing you could really do about it," explained Wease on the front straight while also calling his dad on his cell phone to give him the good news. "We already talked about it already and he said it was not anybody’s fault. Everything is cool." It was the third straight Gerhardt Classic win for Wease’s car owner Rick Gerhardt, who is the son of Fred Gerhardt, the open wheel pioneer that the annual event honors. "It’s a great tribute to my dad and I really appreciate all the fans for coming out," said Gerhardt. "Billy (Wease) is a very good kid, he is aggressive and he has that real desire to win. I think you will see him in the upper stock car levels someday." 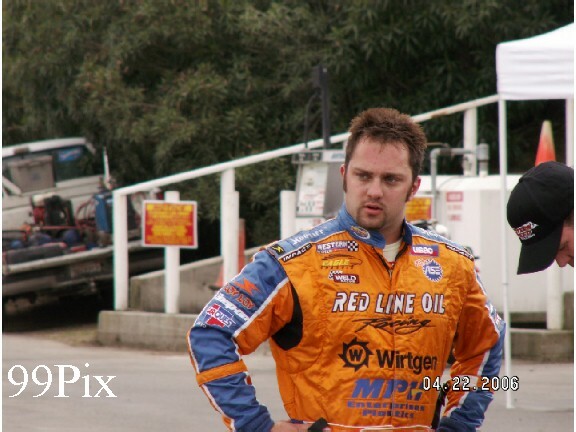 Lincoln’s Tony Hunt, a third generation racer and four time USAC champion, started a distant 11th in the USAC/CASA Sprint 50 lap feature, but that didn’t deter him in the least as he methodically carved his way through the stellar 24 car field. Hunt finally grabbed the lead and ultimately the win with a wheel touching pass on Antioch’s Matt DeMartini on lap 46. 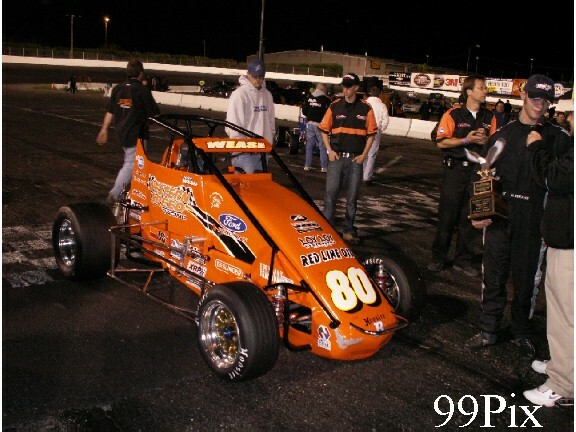 The win was extra special for Hunt who sustained a broken tailbone last season at the 99 Speedway when his throttle stuck causing him to crash hard into the turn one wall. After getting disqualified last week for an illegal part, Stockton’s Joe Allen (a.k.a. Joe Racer) returned with a vengeance as he set a new American Limited Stock fast lap record in qualifying, took the dash and then picked up the victory in the 30 lap main. Allen earned the win with a daring mid race pass in which he and the other two front runners, John Medina of Galt and Darrell Hughes, #28, of Escalon came down the front straight away in a flat out, peddle to the metal, three wide drag race. "I saw the hole and I had to go for it. I was praying I could get by them when we were three wide and luckily it worked out in my favor," described Allen. "You just tighten up and hope you make it." The battle for the championship in the Pro 4 Trucks is shaping up into a real dogfight as Ron Robeck, #3, of Milpitas became the third different successive winner of this young season. Robeck took the lead on lap five, then held off defending division champion Mark Henslee, #6, of Lathrop for the remaining 25 laps. "We had trouble in the early going tonight, but we got it going in the race" said Robeck. "There are several of us who could win the championship this year, but hopefully it is me this time." 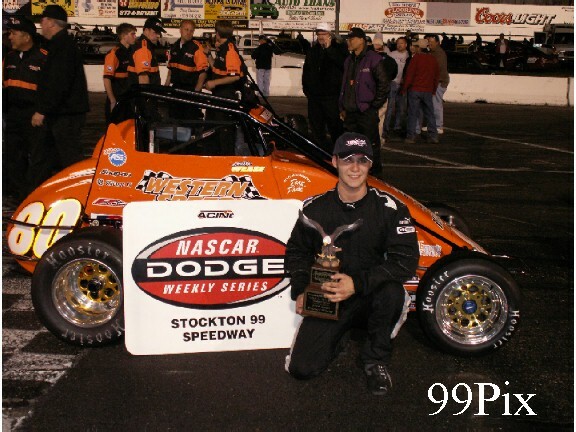 Stockton fans will get one last chance to see the USAC/BCRA Midgets and USAC/CASA Sprints when both series return for an encore performance on Saturday, July 8. 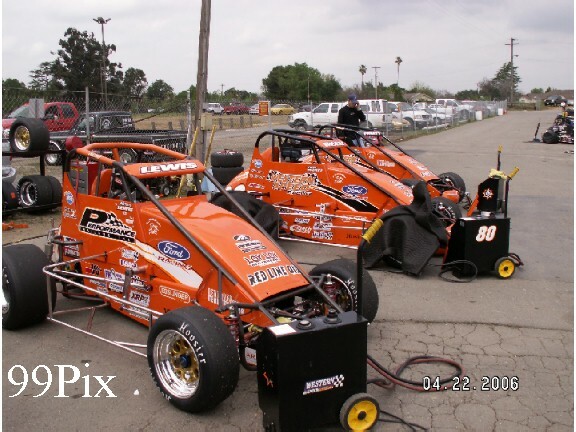 The 2006 season schedule is stocked full of big shows, but none is bigger than next Saturday’s April 29 program as the NASCAR Grand National AutoZone West Series makes the first of two trips to Stockton for the Basalite 150 presented by Havoline. Escalon’s Eric Holmes, Modesto’s Mike David, Fairfield’s Jim Inglebright, Bakersfield’s Mike Duncan and El Cajon’s Austin Cameron are just some of the drivers that fans will recognize among the elite field attempting to gain entry into next Saturday’s 22-car NASCAR Grand National AutoZone West Series Basalite 150 starting grid. In addition, the Western Late Models will be going at it for 100 laps in round two of the special "HOTWOOD 1000" series presented by JM Environmental and Havoline. Manteca’s Ron Strmiska Jr. will be looking to repeat his opening day HOTWOOD win, but to do so he will have to beat back a myriad of top challengers including Salida’s "Slammin" Sam Solari, Modesto’s Harry Belletto, Pete Hernandez of Chicago, Pacific Grove’s Dave Byrd, Granite Bay’s John Moore and defending track champion Pete Anderson Jr. of Stockton. If that weren’t enough, the American Limited Stocks and Pro 4 Trucks, presented by Havoline/C.L. Bryant, will complete the program, giving race fans over three hundred laps of main event action. Can’t wait until Saturday? You don’t have to. On Friday April 28 the public is invited to attend a free practice session in which up to 20 Grand National AutoZone West Series cars will take to the high banked quarter mile in preparation for Saturday’s race. The grandstands will swing open on Friday at 2:00 PM and the cars will hit the track from 2:00 to 8:00 PM for practice. Also, be sure to stop into your local AutoZone store for a $10 discount coupon for an adult admission to Saturday’s race.